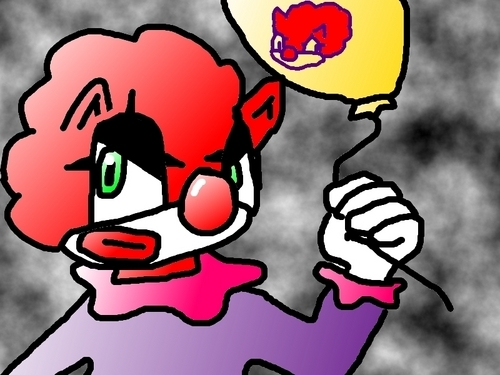 Evil Clown. Okay, so he's a clown, and he's evil. I CAN'T THINK OF NAMES!! So any name suggestions are appreciated.. HD Wallpaper and background images in the Sonic Fan Characters club tagged: evil clown sonic character nameless freyathecat didn't recolour. Nice! I'll think about it! Yes, in our chat we were discussing names for him. I still haven't come up with one though! I think I'll just call him Jangles like Aus said. No one else has suggested names. I don't really want this guy to be as evil anymore... he's just too funny! I'd like him and his crew to be Team Fraser's rivals though. Jangles is currently in a Team with Sweetie the fox and Smash the condor, I just need to upload pictures.